At the Houston Museum of Natural Science at Sugar Land, beautiful weddings are in our nature. If you have a question that is not addressed below, please contact us at abarker@hmns.org for further details. Can I have my wedding reception at the museum? Yes, we have several set-up options to choose from. 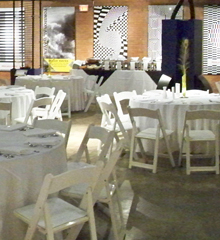 You can contact us at abarker@hmns.org to discuss the location which will best suit your reception needs. We have wonderful venues for wedding ceremonies depending on your particular taste. Create a setting in the T. Rex atrium, among the geodes or in an exhibit hall. What is the maximum capacity of the Museum for a wedding? The Museum can accommodate up to 500 guests for a cocktail reception or 350 for a seated dinner. What are the steps in planning a wedding at the Museum? The first step is to relax – planning a wedding at the Museum is an easy process! Here at the Museum, we have everything down to a science. The second step is to schedule a personal tour where you’ll review your plans and decide which areas in the Museum are the best fit for your wedding.. The third step is to consider catering – the biggest component in planning a wedding at the Museum. The Museum has several exclusive caterers that are contracted to provide food for any wedding. The final step is to confirm your desired date by completing a contract and making a deposit. With any wedding, once you have your venue, everything else falls into place. You can contact us at abarker@hmns.org to discuss all of these steps and to get started. No, you must use one of our approved catering companies. They are familiar with the requirements of staging an event in the museum and make the process seamless. Can alcohol be served at my wedding? Yes. Our caterers are full service catering companies, so you may use them for both your food and beverage needs. Please contact them directly for more information. What information should I have ready when I contact the caterer? Let the caterer know your anticipated date, guest count, and budget. Budget is one of the most important pieces of information, as it assists the caterer in providing you a more accurate proposal. Also, have an idea of whether you want a seated dinner, a buffet, food stations or a cocktail reception. Please visit our Catering page for definitions of each wedding type and catering contact information. The more details you can provide the better. How do I secure a date for my wedding? Return your signed contract and deposit to secure a date. What does the rental fee include for evening weddings? For evening weddings in Sugar Land, the rental fee includes access to all museum exhibit halls, security, house staff and building manager. The fee does not include food, beverage and equipment such as tables, chairs, linens, etc. All of those items are an additional cost and are handled by the museum caterer you select. Please contact the caterers directly for that information. What’s the earliest time my wedding can start? All wedding ceremonies and receptions take place when the Museum is closed to the public. During the summer months, the earliest weddings can typically begin is 7 p.m. During the rest of the year, the earliest weddings can begin is 6 p.m.
No. We customize each wedding according to your needs. Does the Museum offer a place for brides to get dressed? Yes. The Museum has a conference room and smaller meeting rooms that are often used as preparation areas. Does the Museum provide decorations for my wedding? No, the Museum does not provide decorations. One of the benefits of having your wedding at the Museum is that very little décor is needed, as the exhibits serve as décor. You are more than welcome to bring in free-standing décor for your wedding. Please contact us at abarker@hmns.org regarding specific décor policies. When can I have access to the facility on the day of my wedding? Generally you may have access two hours prior to your scheduled wedding. For weddings and receptions, the Museum offers self-parking in the Museum’s parking lot. If you would like valet parking, this service would be an additional cost and can be arranged through any of our catering companies. Please contact the caterers directly for information on costs. Can I have rehearsal prior to my wedding day? Yes. Rehearsals can be scheduled Monday-Friday from 5 p.m. – 7 p.m.
Can my wedding be the only wedding in the building? Yes. When renting the Sugar Land location, the entire Museum is reserved for your use. Can I have a band or D.J. at my wedding? Yes, there are several great locations in the Museum where a band or D.J. can set up. When can I arrange for a site visit? Please contact us at abarker@hmns.org to schedule an appointment for a site visit. Site visits are available with the Museum Monday-Friday from 9:30 am – 4:30 pm and on weekends in special cases.